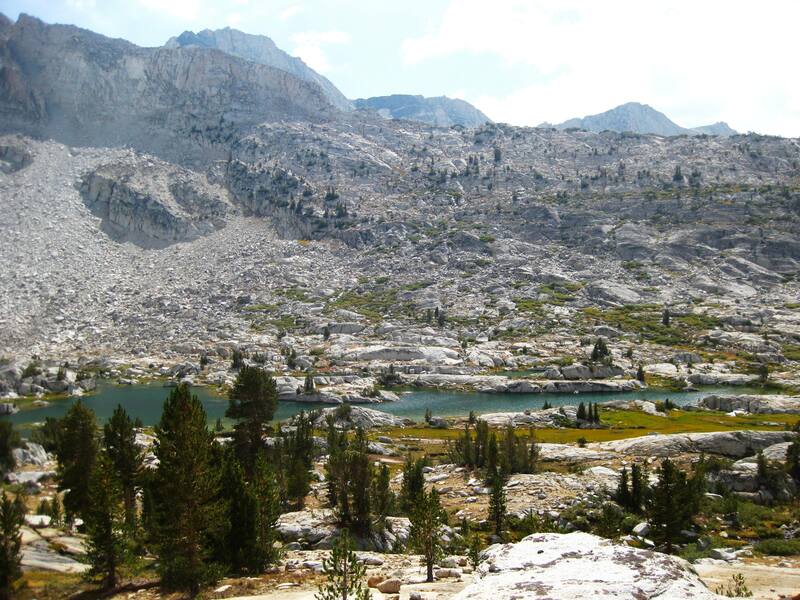 I did my first Sierra Club backpack bus trip during the Labor Day weekend. 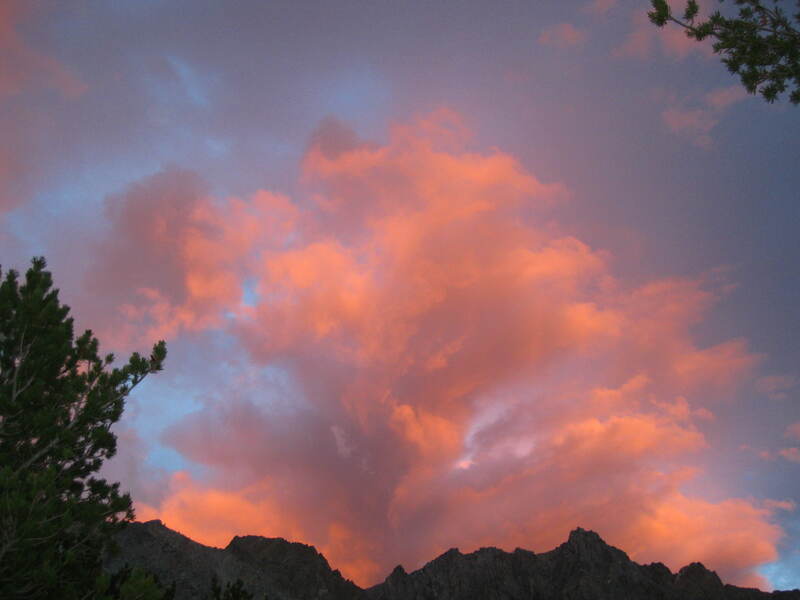 About 50 of us packed a bus on Thursday evening and headed over to Upper Sage Campground near Big Pine, California. 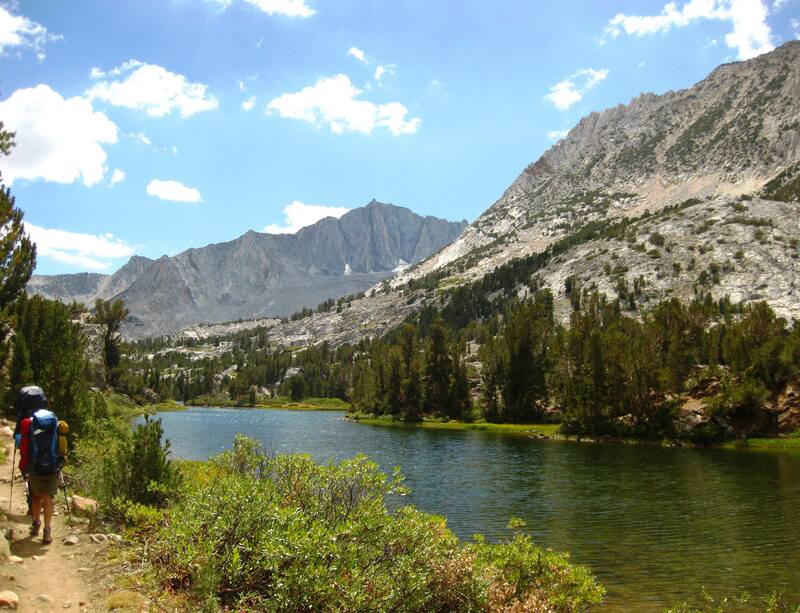 We arrived to the campground at midnight and quickly set up our tents near Big Pine Creek. Friday morning we woke up to clear skies and warm weather. The bus was scheduled to pick us up at 9 a.m. so we had plenty of time to break camp, cook breakfast and reconsider what we were bringing on the trip. My pack weighed about 30 pounds! I also got to meet the 12 other members of my group. A few of them I had hiked with before. 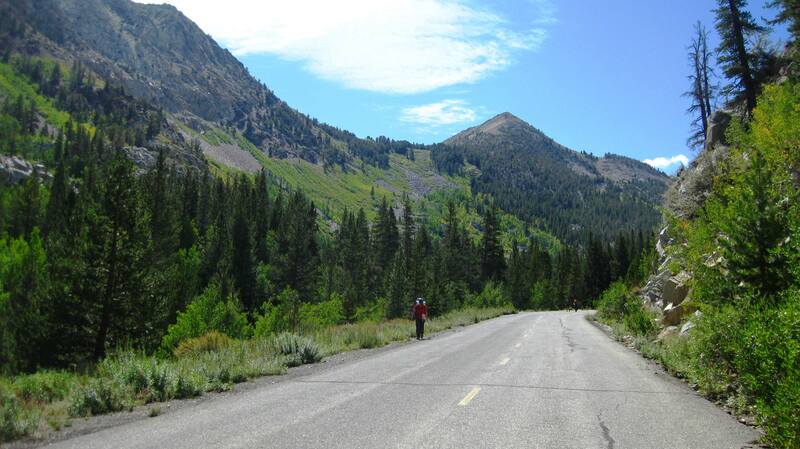 Our trip, Group #3, was destined for Bishop Pass. 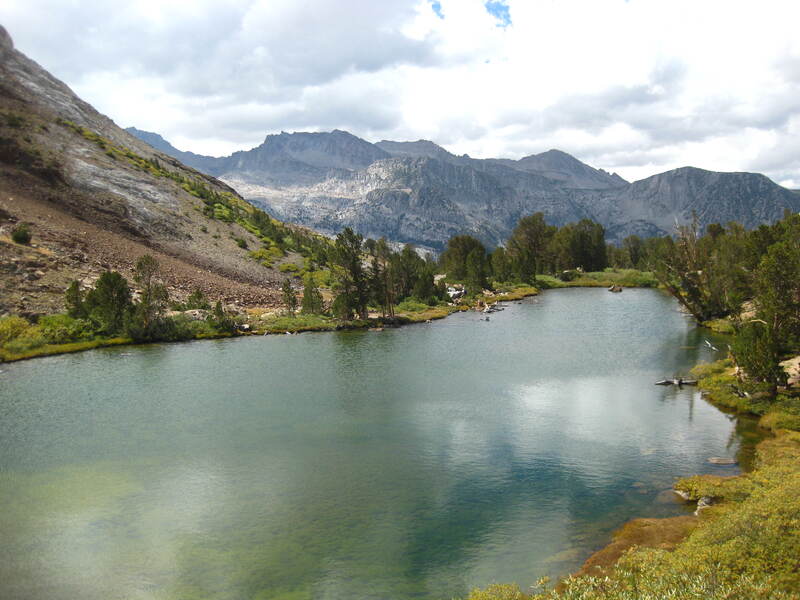 I had been to Mammoth and June Lake before, but this was my first time in the Bishop Pass area. The bus was on time and we quickly loaded again. 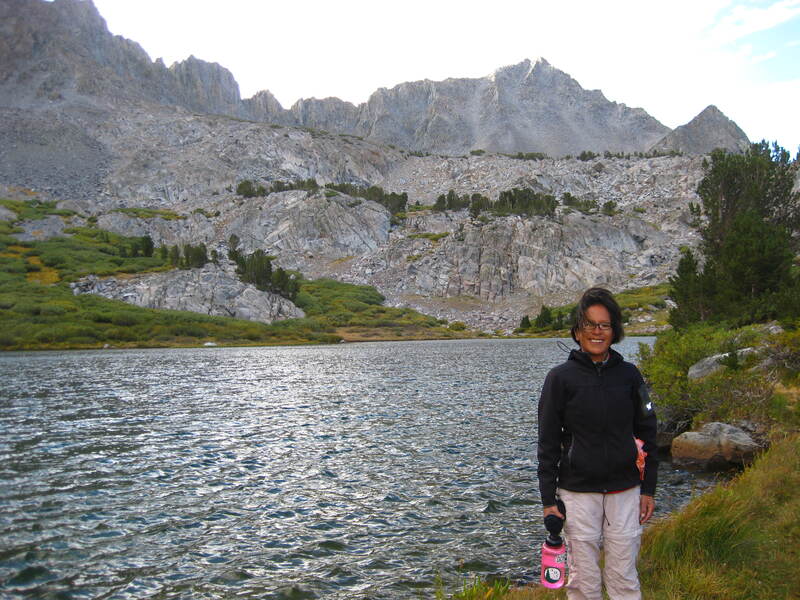 By 11:30 a.m. we were at South Lake, at the Bishop Pass trailhead (it took a long time because we had to pick up permits and drop off the other three groups at their trailheads.) The last time I had backpacked was last Thanksgiving in the Grand Canyon so several days before this trip I was worried. But I meditated and hoped that all would go well. And off we went. Wow. The scenery was amazing. We passed so many lakes, trees, and mountains and the cloud formations were spectacular! I could not stop taking photos. I said to myself, “Now why haven’t I been here more often?” The weather reports for the weekend said 50% chance of rain. 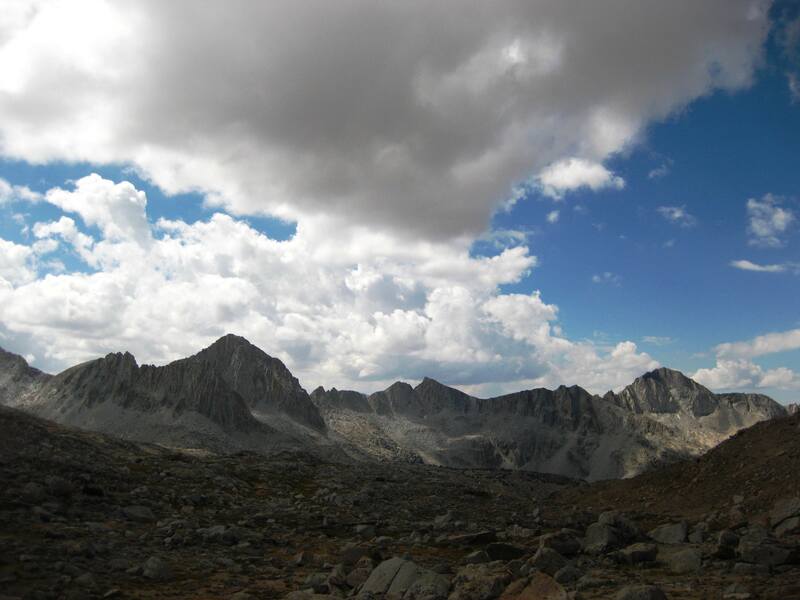 By the time we reached the base of Bishop Pass, the clouds on the other side looked ominous. 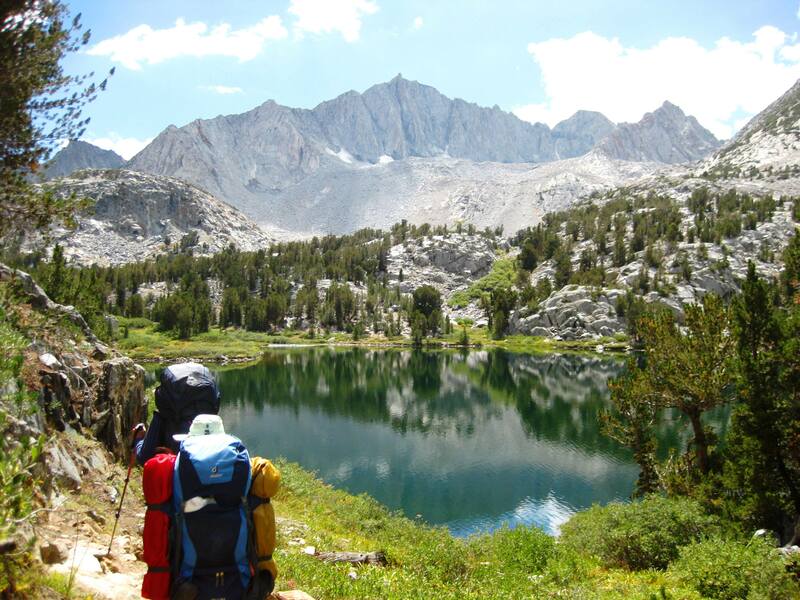 Several members who had backpacked in the area before and the leader decided to set up camp at Bishop Lake and then go over the pass the next morning. So we set up our tents and unloaded packs. Happy hour eventually turned into cooking dinner and before we reached the dessert course it started raining. So we quickly went into our tents around 6:30 p.m. and took a nap. My tent did well against the rain. Finally around 7:30 p.m. the storm had cleared and we went outside to wait for the stars to come out. We stood around and talked and fortunately one person brought a flask of Scotch. I brought a mini plastic bottle of Sangria, but I think next time I’ll bring a flask of Bailey’s. Once I couldn’t withstand the cold anymore I called it a night. And I slept soundly. Saturday morning I woke up to a damp sleeping bag and pad. So we had to wait for our gear to dry out before we could head over the pass. My pack felt heavier since some of my gear was still damp. Anyway, off we marched over to the famous Bishop Pass. Wow! The views at the top were spectacular! It was tough getting over the pass with a full pack but I did it and I enjoyed my well-deserved Snickers Bar. We took a break at the top and took pictures near the sign. 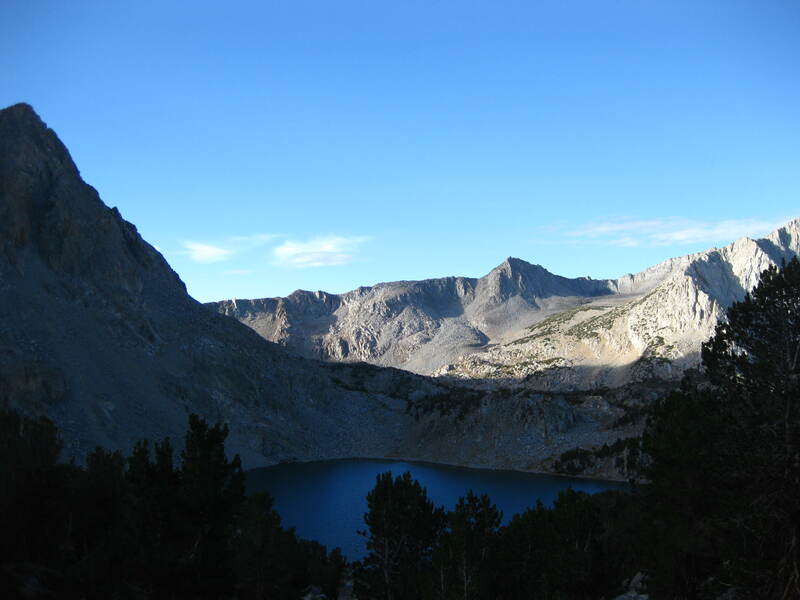 Later that day we set up camp at Upper Dusy Basin lakes and did a day hike to the Lower Dusy Basin lakes. 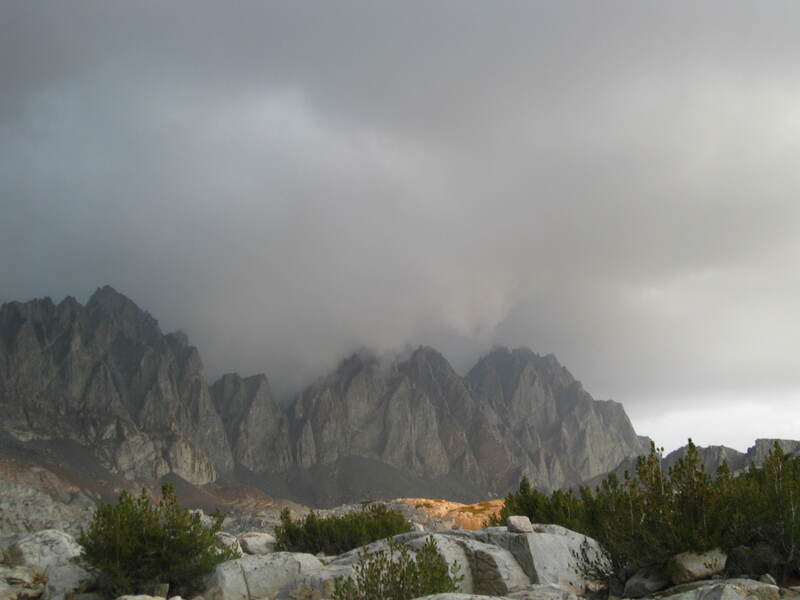 We had wanted to go to Knapsack Pass, but again, the weather looked ominous. After we returned to camp and had dinner, several members decided to dance to the Bee Gees at 10,000 ft. 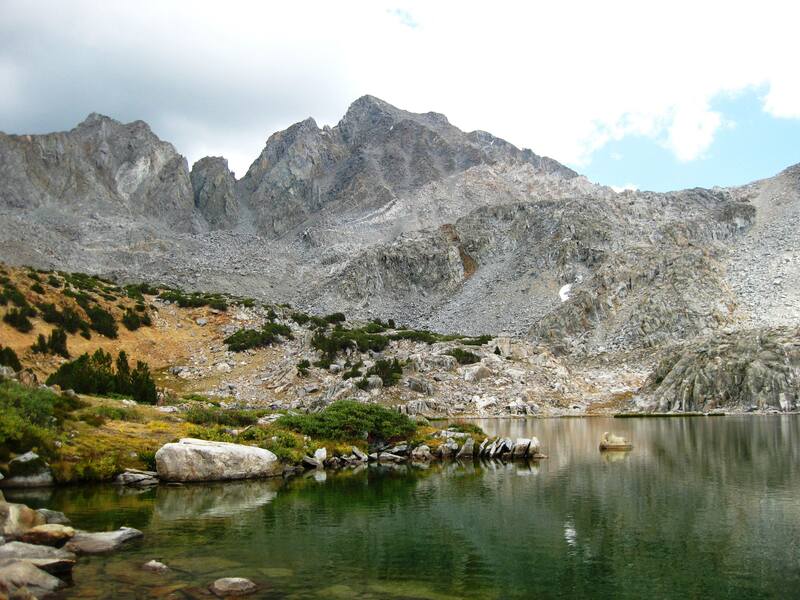 Yes, the Sierra Club has a thing about not allowing sound-generating devices on trips, but….Day 3 found us going over Bishop Pass in the morning on our way towards the Chocolate Lakes. 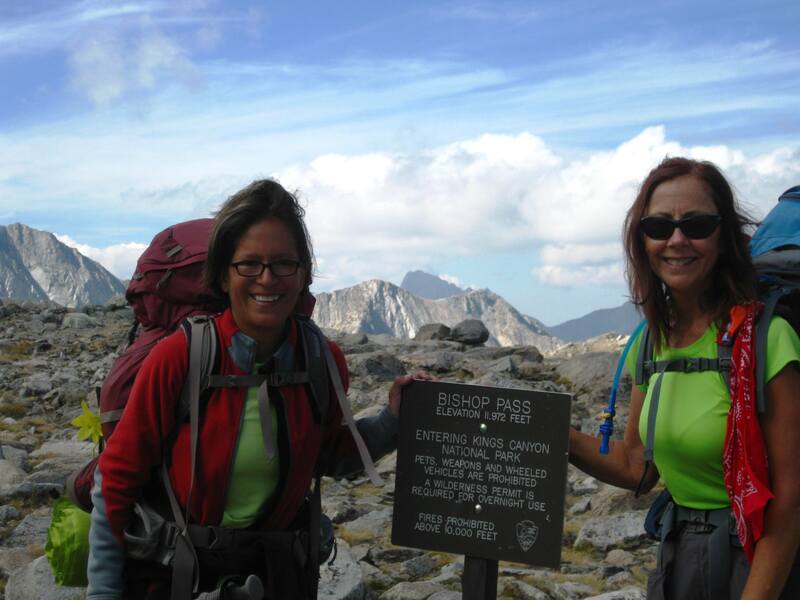 Tina and I at Bishop Pass, again! 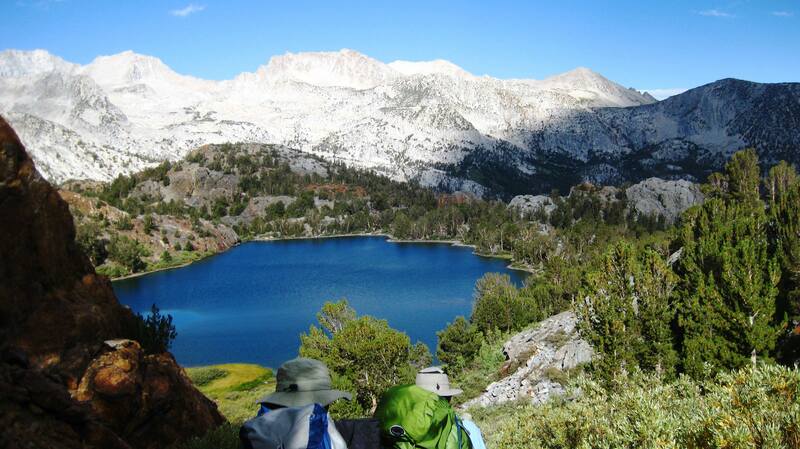 We set up camp at Chocolate Lake #2. That evening we were rewarded by a beautiful sunset! I slept well that last evening and I was not looking forward to the return home. So when I awoke the next morning a friend and I decided to check out Chocolate Lake #3 and hike up to the saddle to see Ruwau Lake. I took a moment to say good-bye and thank you for a great trip. In search of cold beer…. And before I knew it I was back on the bus headed towards San Diego, but at least I was enjoying a couple of Mammoth Brewing brews.